Stereotactic radiosurgery is a highly precise form of radiation therapy used primarily to treat tumors and other abnormalities of the brain. Despite its name, stereotactic radiosurgery is a non-surgical procedure that uses highly focused x-rays to treat certain types of tumors, inoperable lesions and as a post-operative treatment to eliminate any leftover tumor tissue. The treatment involves the delivery of a single high-dose—or sometimes smaller, multiple doses—of radiation beams that converge on the specific area of the brain where the tumor or other abnormality resides. Using a helmet-like device that keeps the head completely still and three-dimensional computer-aided planning software, stereotactic radiosurgery minimizes the amount of radiation to healthy brain tissue. 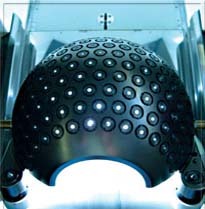 Gamma Knife, which uses 201 beams of highly focused gamma rays. Because of its incredible accuracy, the Gamma Knife is ideal for treating small to medium size lesions. See the Gamma Knife page for more information. Linear accelerator (LINAC) machines, prevalent throughout the world, deliver high-energy x-ray photons or electrons in curving paths around the patient’s head. The linear accelerator can perform radiosurgery on larger tumors in a single session or during multiple sessions, which is called fractionated stereotactic radiotherapy. Multiple manufacturers make this type of machine, which have brand names such as Peacock®, X-Knife®, CyberKnife®, Clinac®. See the Linear Accelerator page for more information. Particle beam (proton) or cyclotron is in limited use in North America. However, several new facilities are being built. You have a pacemaker, artificial heart valve, defibrillator, brain aneurysm clips,implanted pumps or chemotherapy ports, neurostimulators, eye or ear implants, stents, coils or filters. Gamma Knife radiosurgery involves four phases: placement of the head frame, imaging of tumor location, computerized dose planning, and radiation delivery. In the first phase, a box-shaped head frame is attached to your skull using specially designed pins to keep your head from moving until the treatment session is finished. This lightweight aluminum head frame is a guiding device that makes sure the Gamma Knife beams are focused exactly where the treatment is needed. Next, you will be taken to an imaging area where a computed tomography (CT) scan and/or magnetic resonance imaging (MRI) will be performed to show the exact location of the tumor in relation to the head frameDuring the next phase, you will be able to relax for an hour or two while your treatment team performs a computer-aided treatment plan that will optimally radiate the tumor. Next, you will lie down on the Gamma Knife bed where your physician will describe the number and length of treatments to expect. Your head frame will then be attached to a helmet that has several hundred holes in it to allow individual rays of radiation to target specific areas of the brain. The treatment team will then go to another room so that your treatment can begin. You will be able to talk to your physician through a microphone in the helmet and a camera will allow the team to see you at all times. The bed you are lying on will move backward into the treatment area. You may hear a chime at this point and a click as the helmet locks into the radiation source. When the treatment is complete, the bed will return to its original position. The total treatment may last two to four hours. Once your treatment is completed, your head frame will be removed. A linear accelerator (LINAC) is the device most commonly used for external beam radiation treatments for patients with cancer. A linear accelerator (LINAC) is the device most commonly used for external beam radiation treatments for patients with cancer. The linear accelerator can also be used in stereotactic radiosurgery similar to that achieved using the gamma knife on targets within the brain. The linear accelerator can also be used to treat areas outside of the brain. It delivers a uniform dose of high-energy x-ray to the region of the patient’s tumor. These x-rays can destroy the cancer cells while sparing the surrounding normal tissue. 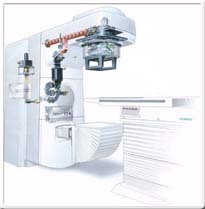 A linear accelerator is also used for Intensity-Modulated Radiation Therapy (IMRT). The linear accelerator uses microwave technology (similar to that used for radar) to accelerate electrons in a part of the accelerator called the “wave guide”, then allows these electrons to collide with a heavy metal target. As a result of the collisions, high-energy x-rays are scattered from the target. A portion of these x-rays is collected and then shaped to form a beam that matches the patient’s tumor. The beam comes out of a part of the accelerator called a gantry, which rotates around the patient. The patient lies on a moveable treatment couch and lasers are used to make sure the patient is in the proper position. Radiation can be delivered to the tumor from any angle by rotating the gantry and moving the treatment couch. The patient’s radiation oncologist prescribes the appropriate treatment volume and dosage. The medical radiation physicist and the dosimetrist determine how to deliver the prescribed dose and calculate the amount of time it will take the accelerator to deliver that dose. Radiation therapists operate the linear accelerator and give patients their daily radiation treatments. Patient safety is very important. During treatment the radiation therapist continuously watches the patient through a closed-circuit television monitor. There is also a microphone in the treatment room so that the patient can speak to the therapist if needed. Port films (x-rays taken with the treatment beam) are checked regularly to make sure that the beam position doesn’t vary from the original plan. Quality control of the linear accelerator is also very important. There are several systems built into the accelerator so that it won’t deliver a higher dose than the radiation oncologist prescribed. Each morning before any patients are treated, the radiation therapist uses a piece of equipment called a “tracker” to make sure that the radiation intensity is uniform across the beam. In addition, the radiation physicist makes more detailed weekly and monthly checks of the accelerator beam.